If this is as fun and easy as the picture suggests, I’m sold. 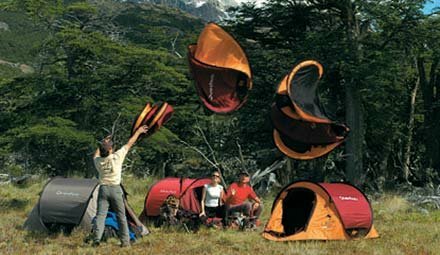 The new line of seconds tents from Quechua will be the fastest tent you’ve ever pitched. Literally, you un-zip the bag and toss it in the air. By the time you can say “Smokey the Bear”, your tent is up. Ranging in price from £24.95 to £54.95 ($49-109) depending on the model, you can have the ultimate in instant-tent and no worries as inclement weather descends upon you. Seven models are available ranging from the “1 second simple” (room for a large and small person) to the “3 seconds” (comes in a light and regular model for three). Recently, the “light” models were introduced which, when folded, are only 50-70cm, enabling ease of transportation. Folding the tent for re-packaging takes nearly ten-times as long as pitching it, but no one should be complaining about 15 seconds on the clock. Honestly, even if you don’t camp often, the concept is so fun, I’d buy it on principle. Clearly, there is a market for those for whom time spent setting up a shelter whilst camping is an issue, as for the rest of us, this tent’s design and concept is just plain really cool.